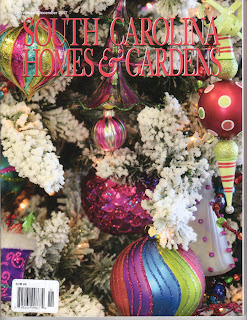 The above photos is from the Nov/Dec issue of South Carolina Homes & Gardens of an article called Strata written by Rachel Haynie. Leaving no earth tone unturned, fiber artist Susan Lenz has been informed for her series, “Strata,” by the earth sciences. Her sinewy compositions, resembling cross-sectional profiles of soft sedimentary layers, debut in the capital city as part of the annual Vista Lights, beginning November 17. For her Autumn Strata, Lenz has plucked minerals right from the earth. In the Winter Strata, she had made monochromatic dynamic by building up the textures. By spring she has gathered violets and scattered them across a verdant field. Summer Strata is an explosion of celebratory color. Works from Lenz’s on-going “In Box” series have evolved into architectural statements worth repeating for Vista Lights. She interpreted ancient structures in an earlier series, “Elements in Architecture,” and pieces from that group remain on view in her studio. Pieces from the exhibition “Stitched!” can also be seen at Lenz’s studio. Recently she has created art-to-wear scarves that are, in some ways, linear versions of her horizontal Strata pieces. 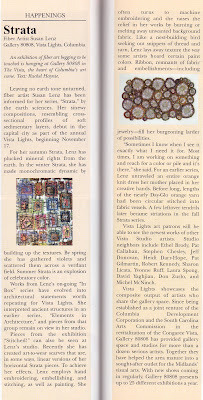 To achieve her effects, Lenz employs hand embroidery, embellishing, and stitching, as well as painting. She often turns to machine embroidery and she raises the relief in her works by burning or melting away unwanted background fabric. Like a nest-building bird seeking out snippets of thread and yearn, Lenz lays away texture the way some artists hoard certain paint colors. Ribbon, remnants of fabric and embellishments..including jewelry…fill her burgeoning larder of possibilities. “Sometimes I know when I see it exactly what I need it for. Most times, I am working on something and reach for a color or pile and it’s there,” she said. For an earlier series, Lenz unraveled an entire orange knit dress her mother placed in her creative hands. Before long, lengths of the nearly Day-Glo orange yarn had been circular stitched into fabric vessels. A few leftover tendrils later became striations in the fall Strata series. Vista Lights art patrons will be able to see the newest works of other Vista Studios artists. Studio neighbors include Ethel Brody, Pat Callahan, Stephen Chesley, Jeff Donovan, Heidi Darr-Hope, Pat Gilmarting, Robert Kennedy, Sharon Licata, Yvonne Ruff, Laura Spong, David Yaghjian, Don Zurlo, and Michel McNinch. Vista Lights showcases the composite output of artists who share the gallery space. SInce being established as a joint venture of teh Columbia Development Corporation and the South Carolina Arts Commission in the revitalization of the Congaree Vista, Gallery 80808 has provided gallery space and studios for more than a dozen serious artists. Together they have helped the area mature into a sought-after outlet for the Midlands’ visual arts. With new shows coming in regularly, Gallery 80808 presents up to 25 different exhibitions a year. To visit Gallery 80808/Vista Studios website, click here.